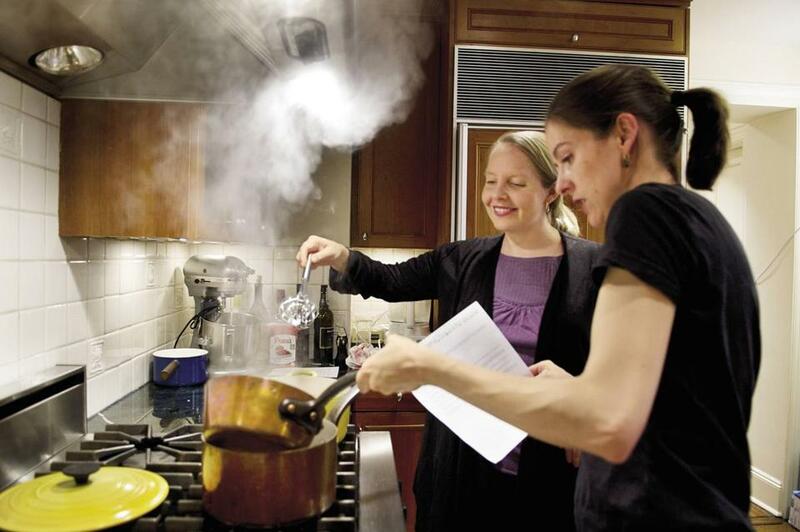 Merrill Stubbs (rear) and Amanda Hesser in the kitchen. With their Food52 website and first cookbook in 2011, veteran food journalists Amanda Hesser and Merrill Stubbs explored the merits of collaborative cooking. On their site and in the book, bloggers and nonprofessionals share recipes, adding tips and shortcuts, so that each dish has a portfolio of intriguing variations. It was inevitable that another cookbook would follow. Volume 2 is much like Volume 1, except that its seasonal recipes start in the fall, rather than summer, and seem to have fewer vegetables. “The Food52 Cookbook, Volume 2,’’ in fact, has dozens of authors and results are uneven. Although the ideas (mostly redefined comfort foods) are good, the execution varies, and I wish the editors had taken a more forceful hand. For example, delicious little sweet potato and pancetta gratins, baked in muffin tins, don’t hold together (even when you carefully size the sweet potato rounds to fit the tin), landing in a confused pile on the plate. Everybody loves roasted broccoli these days, and a smoked paprika vinaigrette is a real find when drizzled over it, especially paired with Marcona almonds. But 20 minutes sounded a bit short for roasting, and indeed the broccoli comes out sporting a sulfurous, raw-tasting crunch. Recipe for butterflied roast chicken with cardamom and yogurt. Afghan dumplings with lamb kofta and yogurt sauce are enclosed in wonton wrappers and the generous, meaty sauce and singing flavors almost make up for the thin wrappers falling to pieces, spilling their scanty filling everywhere. A sausage and kale tart makes an easy-to-love meal, but I doubted one egg plus a little ricotta would bind the filling. Alas, the impressive-looking circle turns into a heap (a tasty heap) when cut into wedges. That said, there are plenty of recipes that behave just so. A savory version of French toast gets doused in scallions and cilantro and dolloped with spicy ketchup, and it’s good. A mostly-classic Greek pastitsio has a few unexpected touches: Mint and sumac play off traditional cinna­­-mon and oregano, and every­-thing’s blanketed in Parmesan bechamel. It’s cozy winter fare and, like all baked pastas, better the next day. A weeknight linguine is tossed with sardines, fennel, and tomato, with bread crumbs mingled with lemon. Butterflied roast chicken, with cardamom, cumin, and coriander-infused yogurt, positively swims with spice-shop flavors. 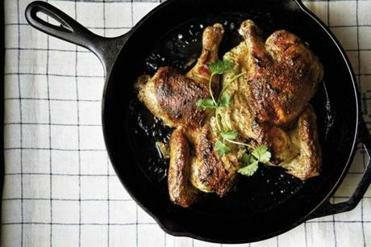 The flattened bird cooks rapidly, with crisp skin all around, an idea good enough to alter your routine for. Some side dishes and treats are keepers, too. Roasted radishes are a surprising discovery when mixed into a roast potato salad and scattered with popped mustard and cumin seeds in yogurt. Orzo salad with beets and beet greens is a simple idea whose few ingredients add up colorfully to more than the sum of their parts. And freshly baked butternut-sage scones offer a nice balance of moist squashy yellow crumb and sharp sage. The second installment of “Food52” is not one of those save-the-day cookbooks you give to new cooks with scant budgets and little time. It’s the kind that food lovers will alternately treasure and argue over. Like life, this book is sometimes inspired, sometimes messy, a bit imperfect, but full of heart.